Project obstacles and solutions: Dollar General has 12,000 discount retail stores in 43 states. Many of these stores serve small communities in rural areas. In 2015, Dollar General announced it was looking at a site along State Highway 42 in the unincorporated town of Cunot, Indiana in Owen County. Cunot is a summertime boating and lake house destination, as it is located just south of Lieber State Park and Cagles Mill Lake. Foster Building served as the general contractor for this project. Like many corporations, Dollar General has a blueprint and timeline for all of their stores. Foster Building has built several Dollar General stores throughout southern Indiana. The Cunot Dollar General was designed to be a 9,100 square foot building with a 32 space, concrete parking lot. One of the biggest challenges was the speed of construction. There was a mere four months from the point that the foundation was poured until the store was opened. IMI delivered concrete on time to keep the construction schedule moving forward. 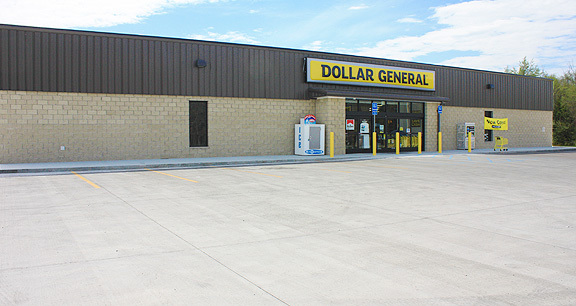 IMI has supplied concrete for Dollar General store construction in three states. Our QC/QA staff have mix designs specific for Dollar General jobs. More importantly, they understand the need to make sure the concrete sets on time without any problems or delays. As the weather changed, accelerators were used in the mix to shorten set times. The Dollar General store in Cunot opened its doors in February 2016, right on schedule. For more information on pouring concrete in tight construction schedules, contact the sales representative for the plant nearest your locations. Click here.